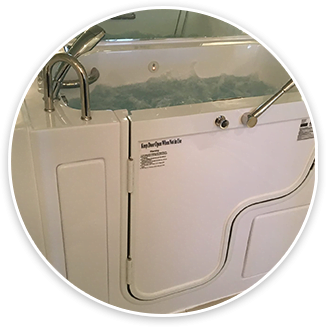 Safe Bathing Canada walk in tubs provide London, Ontario residents with physical limitations and limited mobility the opportunity to bathe in comfort and safety. With a variety of models available to meet your specific requirements, we can now turn your bathroom into a sanctuary. 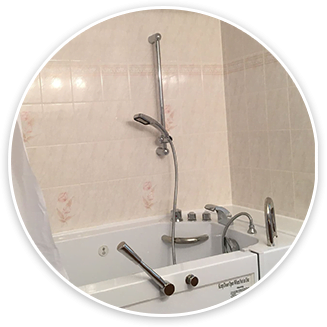 The bulk of household accidents happen in the bathroom which is why it is important to protect the elderly especially from slips and falls in the bathroom. With so many awkward heights, sharp corners and slippery surfaces, the bathroom poses many safety hazards for elderly and disabled people. A walk-in tub can make your bathroom in London, Ontario much safer. The side door of a walk-in tub removes the need to step over the bath rim, which can be difficult for people with mobility issues. The door is watertight to prevent water from seeping out while you bath. A quick-drainage function reduces the amount of time you have to wait for the tub to drain before you can step out again. Speak to Safe Bathing Canada about installing a walk-in tub with aromatherapy, chromotherapy and hydrotherapy options for a luxurious home-spa experience in your very own London, Ontario bathroom. These features provide a wide range of health benefits that extend beyond simply relaxing, destressing, and easing muscle and joint pain. Safe Bathing Canada services residents throughout Mississauga, Barrie, Kitchener and London, Ontario as well as the rest of the country. Our installers are manufacturer trained, licensed and insured to ensure the best results for your new walk-in tub. They can advise you on the best options for your specific needs, whether it is for a home or assisted living facility in London, Ontario. Speak to Safe Bathing Canada today about how you can own a walk in tub from as little as $5 per day by calling 1-844-400-SAFE(7233).